When it comes to crossing continents, a Toyota Land Cruiser is just the vehicle you need to deal with whatever the landscape or weather might throw at you. The fact that it might be more than 20 years old need be no handicap, as a brave team is ready to prove on a marathon fund-raising expedition. They have restored a 1993 Land Cruiser to carry them on the journey that will cover more than 4,600 miles and cross 17 different countries en route from Afghanistan to England. 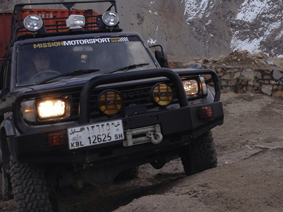 They will leave Kabul in May aiming to reach the Goodwood racetrack in Sussex around three weeks later. We are supporting their challenge and will be covering their exploits with regular reports, pictures and film footage which you’ll be able to follow on our Facebook page, and here on our blog… So stay tuned for more. Leading the expedition is Chris Short, an ex-marine who wanted to make a symbolic journey to encourage other veterans in their readjustment to civilian life. Chris, who will cover the distance on an all-terrain motorbike, is joined by Domenic Senger-Schenk at the wheel of the Land Cruiser, which be loaded with supplies and spares. Film maker Laurence Cameron completes the crew and will be recording the adventure for a television documentary. The trip has been organised and funded by Shoresec Racing, enabling all funds raised to be given to Mission Motorsport, a charity that helps in the recovery and rehabilitation of ex-service personnel through motor racing.